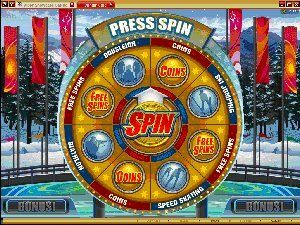 With Wild, Scatter, Free Spin and Multiplier rewards and a thoroughly entertaining second screen Bonus Wheel featuring the main Winter Olympic disciplines; this is a big and very absorbing game with a 0.01 to 0.20 wagering range that will appeal to most pockets. The theme is carried with bright, sharp graphics depicting bob s, biathletes, speed skaters and ski jump specialists against the sparkling snowy arenas in which they compete so fiercely. The second screen Bonus Wheel has 8 stops that can award up to 20 re-triggering Free Spins and as much as 18 000 coins, along with entertaining interactive game selections of racers, jumpers, speed skaters and shooters that can boost rewards. 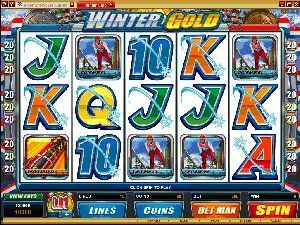 The maximum bet on Winter Gold is 60.00, which can deliver worthwhile returns - up to 20 000.00 in the base game, quadruple that on Free Spins and 6 000.00 on the Bonus Wheel. Take part in the excitement of the Olympics at Rich Reels Casino with Winter Gold - it's a real winner! There's a lot more than just hot air in this video slot!! The latest video slot at Lucky Nugget Casino is sure to raise your expectations when it comes to rewards and sky high entertainment - it's a big, high flying, 5 reel 30 pay-line game we've dubbed HOT AIR. The theme for this fun-filled new offering is hot air ballooning, depicted with amusing cartoon-style graphics featuring a jolly looking pilot and his colorful mode of transport, both of which give the player access to a slew of Free Spin-oriented opportunities for reward. When 3 or more balloons appear simultaneously this triggers a reward of 10 Free Spins in which all wins are doubled. But that's not all - a lucky player may trigger up to 50 Hot Spins with multipliers, which are played at the end of the Free Spin cycle. And for each balloon symbol that appears during the free spin cycle, there's an additional multiplier. The pilot symbol has a dual role in the game, serving as the Wild to build winning combinations and triple prizes, and also delivering an extra hot spin if he appears in the Free Spin bonus cycle. 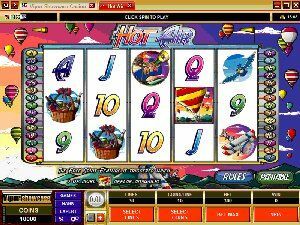 Hot Air offers hours of entertainment through the free spins and assorted multipliers for a wagering range of between 0.01 and 0.05 a line, with a maximum bet of 15.00 across the thirty pay-lines. This can bring the player up to 8 500.00 in the base game and as much as 160 000.00 in free spins. February is the month for Romance, and Love Potion could pave the way! Launching in time for Valentine's Day at Jackpot City Casino is the new 5 reel 9 pay-line video slot LOVE POTION, a game featuring romance and persuasive sorcery from the era of Giacomo Casanova, the Venetian charmer who really knew how to woo the ladies. 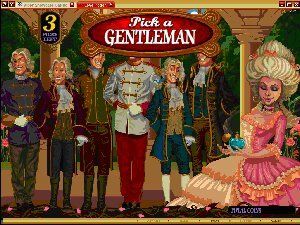 The superb graphics which set the theme for this new slot are redolent with cupids, pink roses, moonlit carriage rides and eighteenth century beaus and belles in all their finery. Appropriately, the delicate ruby Love Potion vial is Wild, enabling the player to build winning combinations by substituting for other symbols across the reels. There are a variety of other ways to score in Love Potion, too, including Scatters that give access to up to 10 retriggering Free Spins in which 5x Multipliers are awarded; a sliding scale of multipliers that can go as high as 100x; a Love Struck Bonus that awards even more multipliers along with prize picks, and a Gamble feature where the player can double or quadruple winnings by correctly predicting the color and suit of the next card. On a maximum bet of 45.00, a player who is lucky in love and gambling can reap rich rewards: up to 12 500.00 in the base game, a massive 62 500.00 on the generous Free Spins and 4 500.00 on the bonus. Celebrate Valentine’s Day with your own bouquet of love and romance on Love Potion. LOOKS LIKE A COUPLE WOULD BE A BLAST BUT JUST WONDERING IF ANY OF THE 3 WILL BE FOR US PLAYERS WE SEEM TO BE GETTING THE SHORT END OF THE STICK WHEN IT COMES TO MICRO I HAVE PLAYED LESS AT MICRO THEN I EVER THOUGHT I COULD I LOVE VEGAS REGAL!! I heard the new games came out today good luck to all that get to play them!! I really miss the micros. Every now and then vegasjoker used to pop a little money in my acct for no apparent reason whatsoever and give me $50 every xmas.